Welcome to your cabin hideaway on the river, with unparalleled access and views! The spacious deck and yard is perfect for relaxing in the sun and listening to the river, or hosting a summer barbecue! Amazing river views from nearly every room. This charming cabin is brimming with character from the vaulted ceilings with beautiful beam work down to the wood accents in 3 custom bathrooms. There is plenty of space with 3 bedrooms and a storage shed. 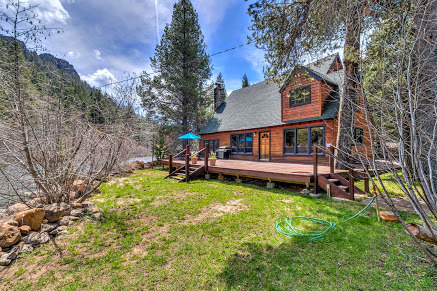 Centrally located – only 10 minutes to Truckee, Squaw Valley, or Tahoe City.